EUR was supported by the Factory Orders in Germany and at the same time the Eurozone’s Sentix investor confidence index increased. In the US, on the other side, labour market conditions index fell. EURUSD is moving within the long term ascendant channel and short term descendant channel around the Fibonacci retracements. The pair already passed the selling opportunity at 50% retracement. 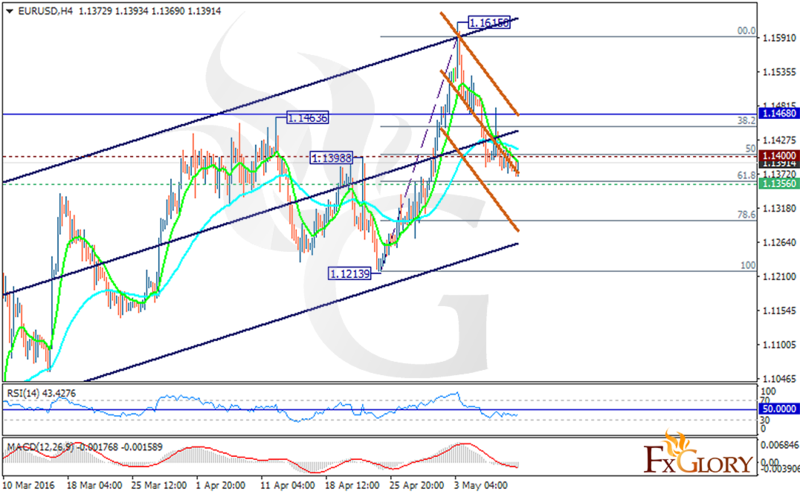 The support lies at 1.13560 with resistance at 1.14000 which both lines are below the weekly pivot point at 1.14680. The support level breakthrough can suggest a close reversal. The MACD indicator is in negative territory signaling the price decline and the RSI is below the 50 level confirming the selling opportunity.The EMA of 10 has also passed the EMA of 50 and is moving below it. After the support level breakthrough sellers can target 1.1260.